The one thing all baby mammals have in common is that all only feed on their mother’s milk in the first stage of their lives, i.e. until they are weaned. Weaning period differs amongst species and can vary for a few weeks to a few years – this is often directly proportionate to the lifecycle of the species. Although it may seem that any baby animal can simply be bottled-fed packaged milk, this is in fact not true. 1. Colostrum – Colostrum is the first milk produced by the mammary glands at the time of parturition and precedes the production of true milk. It is not only a highly concentrated source of energy but also contains a boost of maternal immunoglobulins that are essential for building the immunity of baby animals. Infants that have been deprived of colostrum – esp. baby mammals rescued as newborns, are even more susceptible to various infections. They require extremely high levels of hygiene and caution for the first few weeks of their life, until they have developed their own immunity. Suitable replacers are currently available for the new born of some species. 2. 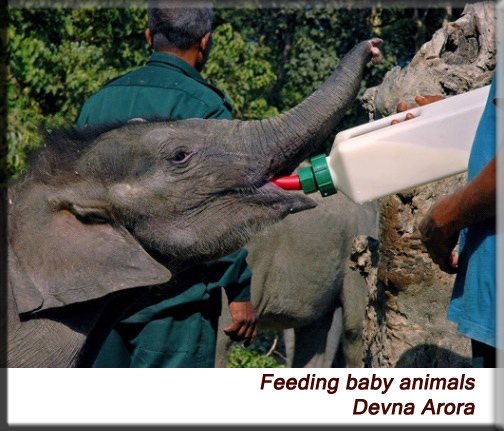 Milk – Milk is an ideal source of energy, calcium and protein for the growth and development of baby mammals. Although all baby mammals have milk, the composition of milk may vary immensely between the milk of different species. Seal milk, for example, is extremely high in fats with up to 70% of dry matter, 30% of water and nearly 60% of milk comprising of fats. Rhino milk on the other hand is extremely high in water with over 90% of water, barely 10% of dry matter and only a negligible trace of fats. 3. Formula – It is important to keep the composition of the mother’s milk in mind when formulating an appropriate formula. Although deficient formulas may be readily accepted by babies and they might not necessarily do them harm, adequate growth and development can only be achieved through wholesome and well-balanced (as per the species) formulas. The fats, sugars and water content must be balanced appropriately to obtain maximum benefits for the babies. 4. Lactose – The most common milk substitute that people are tempted to use for orphan babies is cow’s milk – this is highly dangerous and often fatal for babies. Cow’s milk contains high amounts of lactose which is not easy to digest by most other species. Formula milk (containing evaporated milk powder), is only comparatively easier to digest than fresh cow’s milk. The addition of probiotics and other digestive enzymes can be vital in the formulation of a digestible formula. For more information on types of feeders for baby aanimals, please refer to Examples of feeders. Unlike mammals, milk is in no way a part of any bird’s diet and it must never be given to birds. Although birds may digest miniscule amounts of milk and milk-based products, they are nest avoided. 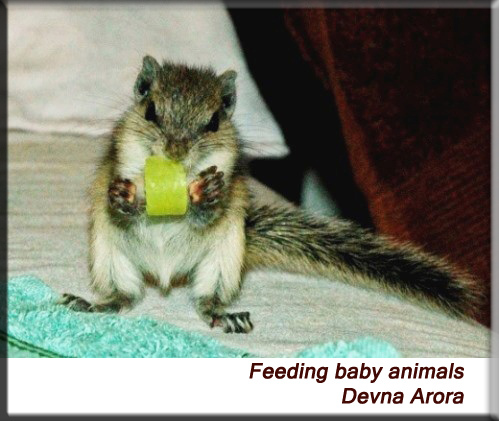 As a general rule of thumb, a baby mammal requires 10-20% of body weight in feed every day. 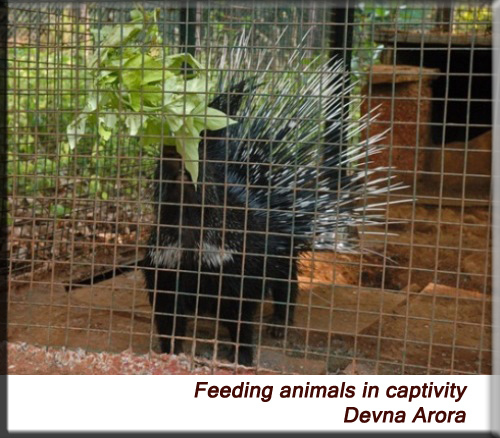 The precise amount of feed will vary accordingly to the density and nutritional value of the feed and it best to follow the feeding guidelines for the species in concern. 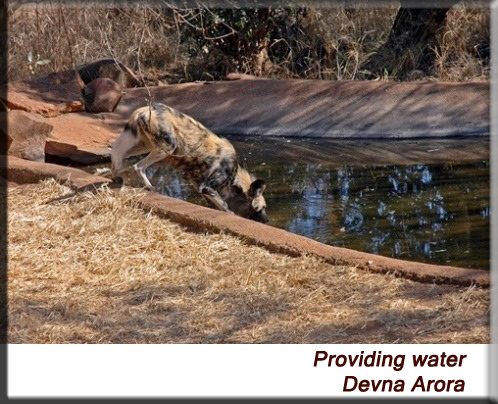 Liquid feed quantities – rehydration solutions or formula, must always be limited to 3-5% of body weight per feed. •	Offering whole foods where the animals need to shell or skin it themselves. •	Younger or smaller animals may be given whole foods with small slits, cracks or small amounts of peeled skin to help them begin and accomplish the task themselves. 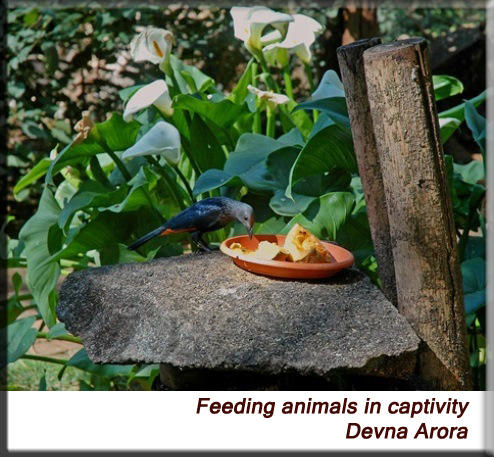 •	Scattering food around the enclosure whereby an animal spends considerable amount of time searching of it – the reward being the food itself. •	Hanging food in different places for arboreal species. •	Burrowing food for those animals that burrow and dig out roots. •	Keeping treats (tempting or more desirable foods) just slightly out of reach to encourage the animal to spend more energy in pursuing it – this encourages constructive brain activity and the building of skills. •	Offering appropriate live prey where legally permissible – this is vital for rehab. •	Offering a variety of foods – no human being or animal likes to eat the same thing day in and day out – we all need a change. This is not only for a change in taste but also ensures the intake of various nutrients. Animals too must be given foods in a rotation so they can be joyous to see the food offered and relish what has been given to them. 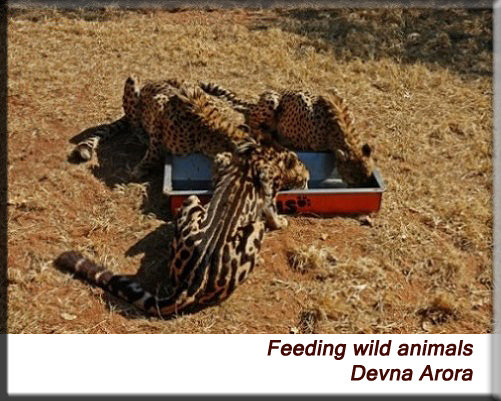 •	Feeding at different times of the day also helps in preventing the animal from falling into a monotonous routine. Ensure there are some tidbits lying about if you want to play with the feeding timings though – no animal must ever be made to starve in the process.